It was a hot summer day in 1913 at the Chicago White Sox park, Comiskey Field. Seated beside his father in a box along the third base line was a seven-year-old boy awaiting one of the momentous experiences of his life. He was about to see his first major league baseball game. The boy watched him and quickly came to loathe him. How could he help despising this visitor from Detroit who virtually alone defeated the boy’s unfortunate favorites? Three hits, two stolen bases, two runs driven in, two runs he himself scored. So says an old scorecard that retains the tragedy’s details. Year after year during the fourteen seasons that remained in this devastator’s career, the boy, himself experiencing time’s passage, watched with awe. Childish hatred was gone. Wonder replaced it. In the course of twenty-four playing years: twelve American League batting leaderships, nine of them in a row; twenty-three straight years of hitting .300 or more; the all-time career batting leadership, .367, approached by others in both leagues but never matched. The boy-grown-older (myself, if you have not already conjectured it) was moved to certain recollections when in 1949 the papers noted that the old champ would be coming from California to see the New York Yankees-Brooklyn Dodgers World Series. An earth-shaking event suddenly shook me. He would be staying at the home of an old friend, a native of a town near Atlanta, who was an acquaintance of mine. The latter, knowing my longtime sense of marvel, invited me to pay a call. What is the world’s record for speed of acceptance? Half a second? A nervous acceptance, to be sure, and one that called for preparation. The morgue of the newspaper for which I was working provided a start, but a somewhat confusing one. He was cruel and mean. He could also be gentle and even kindly. Most veteran sportswriters saluted him as the most eminent in his craft, but not all. The New York Times’ exemplary columnist, John Kieran, favored Babe Ruth, because Ruth had been a fine pitcher before he became the home-run genius. And so on and on. There I was, then, at his doorway. The alleged tyrant greeted me with a smile and a warm handshake. It must have been five minutes before I could manage to say more than a few words audibly. Finally I spoke in a voice that didn’t shake. Happily for me I was able to come up with my recollection of a major and potentially career-ending day in his life. By chance on an afternoon back in 1920 I was taken to a Tigers-White Sox game in Chicago when he and his fellow outfielder Ira Flagstead crashed in pursuit of a fly ball. For a month or more he was in a cast. No one could be sure if he would ever play again. “I was lucky, he said now, and went on to chat about what it was like in his early days to try to hit balls soaked with licorice and tobacco juice and to face the Washington Senators” peerless Walter Johnson. As countless visitors had asked him, I wondered whom he placed on his all-star team. Old-time fans, I suggested, would be startled when he failed to mention a celebrity named Cobb instead listing Shoeless Joe Jackson along with Ruth and Tris Speaker in the outfields. “Shoeless Joe’s batting stance was a model for me,” he merely replied. Down the years since then I have replenished my picture of him from one source or another. Among them is the autobiography published in 1961, the year of his death. I value scores of touches in it. On October 2, 1907 he stole four bases in one game. How many runners have you seen do that? 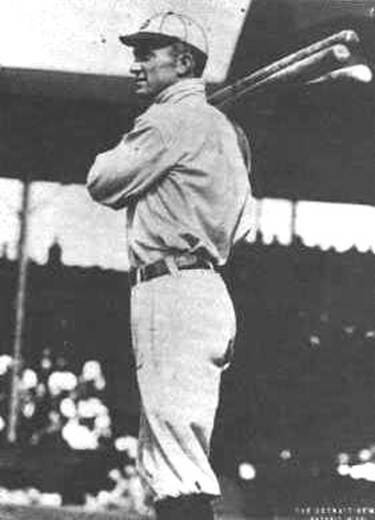 In 1908, a batting championship year, he asked for a huge $5000 salary from a reluctant Detroit management. He denied spiking Philadelphia’s third baseman, Home Run Baker, although he did admit to me that he once did so because, he said, Baker had tried to injure him. “Never in twenty-four years did I do anything low or underhanded,” he says in his book, although I cannot help wondering if that lofty disclaimer was not written by his collaborator, Al Stump. What more could any departing titan have asked?